In the heart of the medina, close to the carpenters’ souk, Nejjarine Square is one of Fez’s most beautiful historic squares, best known for its distinctive centerpiece – the Nejjarine water fountain. Elaborately decorated with ornate carvings and zellij tilework, it’s the kind of drinking fountain normally seen fronting mosques or palaces. Also taking prize place on Nejjarine Square is the exquisite Fondouk el-Nejjarine, an impressively preserved 18th-century funduq (historic traveler’s inn), now home to a fascinating carpentry museum. Inside, the interiors are decked out with magnificent wood-carved balconies and sculpted pillars, while the permanent exhibition houses a remarkable collection of wooden arts, crafts and carpentry tools, dating back as early as the 14th century. Nejjarine Square is located in Fez Medina (Fez el-Bali), not far from the Al-Attarine Madrasa. Follow winding streets into the heart of the Fez medina, a UNESCO World Heritage Site, on a guided walking tour through the walled city. Pass a series of historic mosques, the Nejjarine Fountain, an iconic madrasa, and the colorful tannery, then browse for handicrafts at a traditional souk, or market. Walking alongside an expert local guide, you’ll learn the stories behind the medina’s intricate gates, with tips on where to eat, drink, and explore in one of Morocco’s most vibrant cities. Enhance your Andalusia trip by swapping Spain for a 3-day private guided tour in Morocco. You’ll save hours researching your trip and planning transport by having everything organized for you. A ferry crossing is included, as well as minivan transport. Morocco highlights include Fes, Tangier, and Chefchaouen. Conveniently, accommodation is provided, as well as many activities such as museum visits, and trekking. Visit the Imperial City of Fez on a full-day, private tour from Casablanca that explores the very best of the medieval landmark. Enjoy the flexibility and personal experience of a private guide as you walk the winding streets of the medina, a UNESCO World Heritage Site, then visit city highlights such as the Zaouia of Moulay Idriss II, the Kairaouine Mosque, and Bou Inania Medersa. This full-day private trip includes pickup and drop-off at your Casablanca hotel, all entrance fees, and a sightseeing tour with a local guide. Follow ancient, winding lanes into the heart of the Fez Medina with a 6-hour, private walking tour that’s the perfect way to experience this fascinating medieval city. Discover historic mosques and hidden caravanserais, and see a legendary pair of madrasas. Take in picturesque gates, the Moulay Idriss Mausoleum and the city’s distinctive, colorful tanneries. Learn about the history and culture of one of Morocco’s Imperial Cities, and enjoy the flexibility of a private tour to explore at your own pace, with time to visit the places that interest you most. 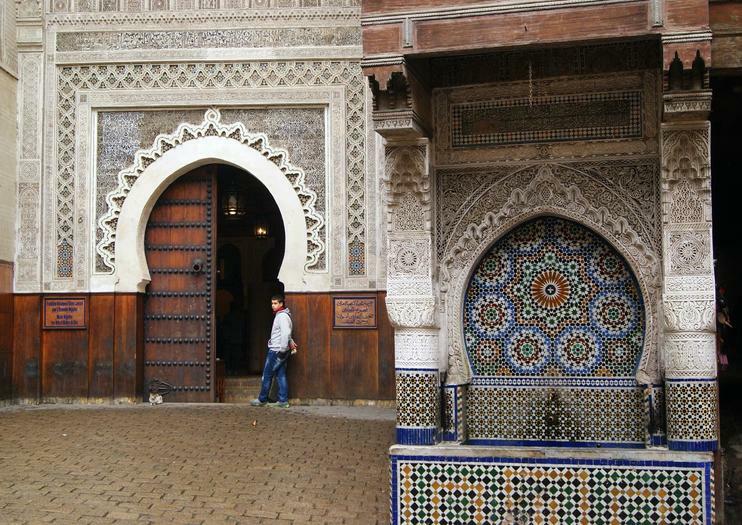 Discover the iconic sites of an ancient Imperial city on a private, full-day tour of Fez. Take in the broad esplanade of the Royal palace and the 16th-century architecture of Borj Sud, then go deep into the UNESCO-recognized medina. Follow narrow lanes to covered bazaars and an eminent madrasa, and pass riverside tanneries and hillside shrines. Get a glimpse of daily life in bustling Nejjarine Square, discover Moroccan art in the Dar Batha Museum and leave the medina to visit potters’ studios and Borj Sud, an imposing Saadian watchtower. If you are already visiting Spain or plan to do so, extend your journey south to the Kingdom of Morocco, it’s only 14 km from Tarifa port south of Spain (45 minutes by ferry or one hour flight from Madrid). Morocco is a must go destination for travelers visiting Spain or Portugal. As a neighbor, Morocco has a complementary culture to Spain, sharing much of the history and landscape. However, a trip to Morocco remains a different experience. So allow us to help you plan your Morocco tour from Spain. Nothing could be more introductive of Morocco's captivating qualities than its Majestic Imperial cities. With a powerful history thousands of years old, exceptional cultural and social diversity, and immeasurable intellectual depth, Morocco's distinctive nature enriches all who experience it.If you have only 8 days to spend in Morocco, this is the best tour for you to explore the history, architecture, culture and cuisine of this fascinating country. You will visit Rabat, Meknes, Volubilis, Fez, then the Atlas Mountains which lead to the best man-made oasis on earth, namely Marrakech.